This photo was going to be a part of my post on “Extreme Macro,” but I did not finish writing it in time for publication today. So to whet everyone’s appetite, I thought I’d give a sneak peek preview of what an extreme macro shot looks like. I can’t quite remember what focal length this was on, but it was on my full set of extension tubes. Extension tubes plus reverse lens at 18mm, comes in roughly at 5.9x magnification, so it’s in that ballpark. That’s what gets you a full frame of jumping spider face. Hopefully by tomorrow I have my article finished and published. Until then, thanks for following along! 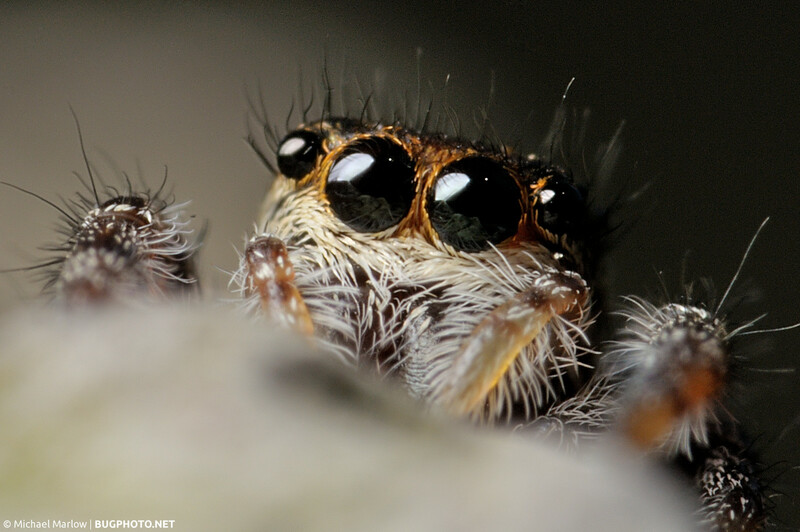 Posted in Jumping SpidersTagged big eyes, bug face, bug portrait, extension tubes, extreme macro, jumper, macrophotography, Salticidae, uncroppedBookmark the permalink. 5.9x. Wow! Not much depth of field at that magnification, but were you wearing a hat that day? I can sort of see a reflection in the eyes that might be you holding your camera…and I call that fantastic shooting. Yep, the depth of field is down to a sliver of a sliver, which makes it more useful for *really* tiny things (or focus stacking). Not sure about the hat, might have had a visor on. The bright white spot is the reflection of the flash diffuser. I can also see some hairs in and around what I believe is the reflection of the top edge of the fence post of which both the spider and my camera were peeking over (from opposing sides). Despite the DOF challenge you managed to get in focus what needs to be in focus. Very nice, well composed photo.